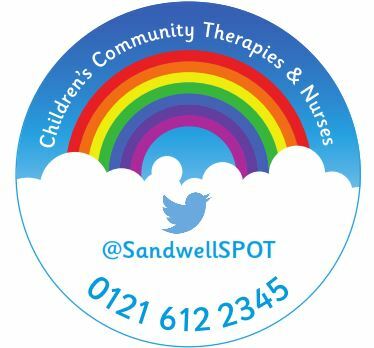 The Children’s Therapy and Nurse Service is an integrated service consisting of Community Children’s Nurses, Occupational Therapists, Physiotherapists, and Speech and Language Therapists. To speak to a therapist you can ring The Lyng Health Centre on 0121 612 2345 and they will get a therapist in your area to contact you. To make a referral please see the ‘how to refer’ section. Assess the child’s s needs. Carry out regular work with the child to help them to improve or maintain their skills in particular areas of development. Collect information regarding their development, discuss concerns and goals with parents/carers. Share information with educational staff and other medical professionals to ascertain everyone’s concerns and plans for the child. Train parents/ carers and staff to deliver programmes of work to help the child develop or maintain their skills. Deliver training courses for parents or professionals involved in a child’s development. Training others is a big part of our role. A child’s development is a shared responsibility amongst all those working with the child, not just the therapist! For more information about disabled access for this service, please click here. A speech difficulty is when children cannot say the right sounds for their age, or their talking is difficult to understand. When children learn to talk, they use easier sounds first – like ‘m’, ‘b’ or ‘d’. Later on they begin to use the harder ones – like ‘s’, ‘f’, ‘k’ or ‘sh’. All children will simplify words if they’re not yet able to use the correct sounds but sometimes children find it especially difficult to learn new sounds. Language is split into two parts: understanding things and expressing things. Children with language difficulties may not be using words at all, or only using single words. They may confuse words or struggle to make sentences. Depending on their age, they may find it difficult to understand what people are saying to them. Stammering or stuttering is when children know what they want to say but struggle to get their words out. For example they may repeat words, repeat the sounds in a word, lengthen the sounds in a word or struggle to get the word out at all. Many children under five will experience some stammering, though most of them will grow out of it. Young children are often not aware of their difficulties and it is best not to draw their attention to it, instead keep easy eye contact and allow them plenty of time to talk. Stammering doesn’t always happen when you expect it, so don’t worry if the Speech Therapist doesn’t hear it during an assessment. We don’t see children who are fussy or faddy eaters. You can get advice about children who ‘can eat but won’t eat’ from your health visitor, GP or local children’s centre. • A hoarse or breathy quality to their voice. • Sounding as if they are straining their voice. • Sounding unusually deep or high pitched for their age or size. • Sounding too quiet and breathy, making it difficult for them to be understood. There may be several reasons for these problems and any medical problems should be investigated before a speech and language therapist becomes involved. Therefore it is important that children are seen by a GP or ENT consultant (Ear, Nose and Throat) first, who can refer to us if necessary. Occupational Therapists work with children and young people who have a physical disability which affects participation in the everyday activities s/he either wants, needs or is expected to take part in. The difficulties may impact upon play, leisure and/or access to education. Physical conditions that might affect the child include cerebral palsy and dyspraxia. 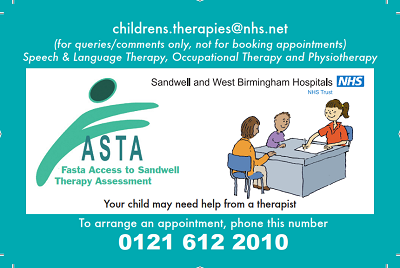 If you would like to make an appointment for a child to see an Occupational Therapist, Physiotherapist or Speech and Language Therapist please call the FASTA line (Faster Access to Sandwell Therapy Assessment): 0121 612 2010. Referrals may be instigated by professionals but parents must make the phone call to make the appointment. You will be asked to give the child’s details and briefly explain your concerns. You will then be offered a choice of clinic; the first appointment will be arranged over the telephone and confirmed by letter and/or SMS text. The therapist will see the child in clinic for the first assessment. The therapist will then assess the child either indirectly through observations, or directly with the child through face to face assessment. Finally the therapist will give recommendations and set targets for parent and the child to carry out at home as necessary. Parents will have an opportunity to ask questions and talk about any worries. The appointment should last no longer than an hour. Reviewed in clinic, nursery, school or home. Offer advice to the parents/ implement strategies at nursery / school to help develop the child’s skills first. 4. If no progress has been achieved consider the child’s other skills: does he/ she have global developmental delay or a specific difficulty? 5. If the child has a specific difficulty speak to the family about your concerns and explain that you think that Occupational Therapy / Physiotherapy / Speech and Language Therapy may be able to help them/ their child. 6. Give the Mum/ Dad/ Carer the FASTA hotline number – 0121 612 2010 (see above for opening times). Provide a reminder of the phone number by giving parents/ carers a compliments slip or business card. How can I refer to Children’s Community Nurses? We accept referrals for children who have a Sandwell GP, and the referral is made by a hospital consultant. If we are unable to take your call you can leave a message on voicemail and someone will get back to you as soon as possible. For all our latest updates and tweets please see our Twitter pageand don’t forget to us! Justin and Denise collecting their awards! Innovation Award: presented to an individual or team that has pushed the boundaries of research, technology or clinical practice. Justin Drew – Symbols 2 Write-An app to develop children’s narrative skills and literacy through symbol supported text. 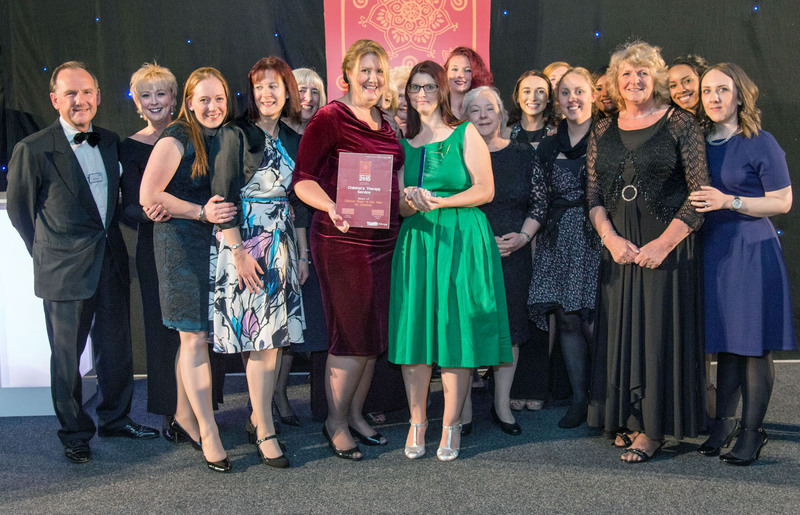 Clinical Team of the Year for Children – The Children’s Therapy Team won the Trust’s award for the great work they have done over the last year. Below are some useful links you may be interested in. They include some general speech and language advice and activities you could do. http://www.thecommunicationtrust.org.uk/ – This website has lots of resources including downloadable booklets on a wide range of speech, language and communication difficulties and short films about ways to help your child at different age. afasicengland.org.uk – Afasic is the UK charity representing children and young people with speech, language and communication. The website has a range of information including simple advice sheets. http://www.talkingpoint.org.uk/ – This website has lots of useful information including information about speech and language development. http://www.wordsforlife.org.uk/ – This website is great for activities to help your child’s language development for ages 0-11 years old. Enhanced therapy services : Would you like to buy in more speech and language therapy? See our information leaflet, in the patient information tab, for more information.